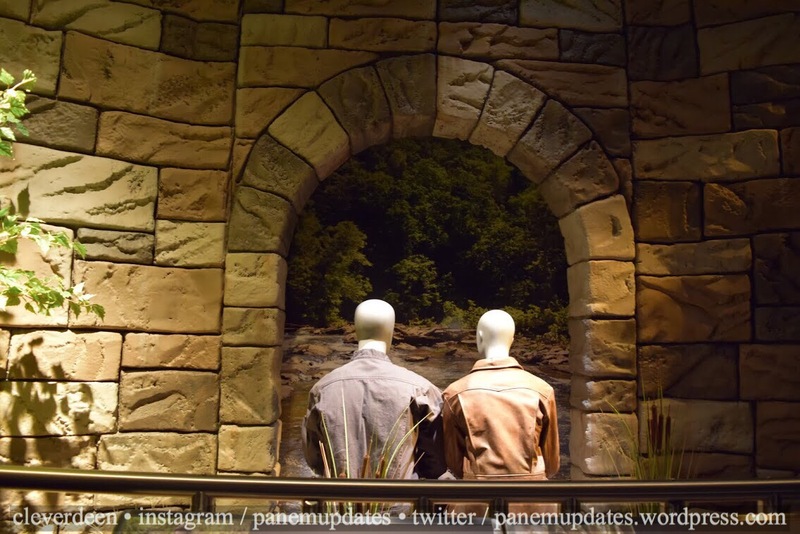 Yesterday (June 28th), I had the pleasure of attending an early preview of The Hunger Games: The Exhibition. 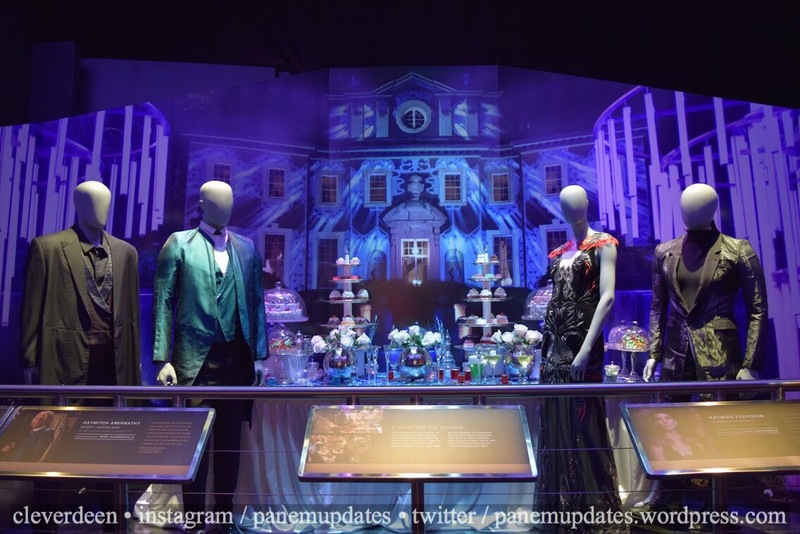 I have some exclusive photos and descriptions of the exhibition below! I arrived at Discovery Times Square in New York City in the morning, ready to meet up with friends and enjoy the exhibition. 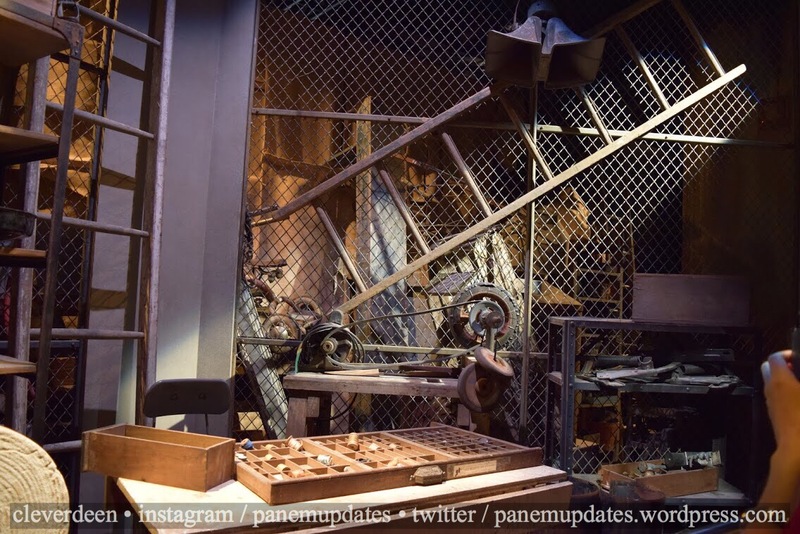 Once we were let into the building, we climbed up a few stairs and walked down the hallway. We were then led downstairs and given audio guides for the exhibition. Next, there was a photo op: in groups of four or less, we were told to pose first happily, then like we were scared, then triumphantly, and finally we were told to make silly faces. 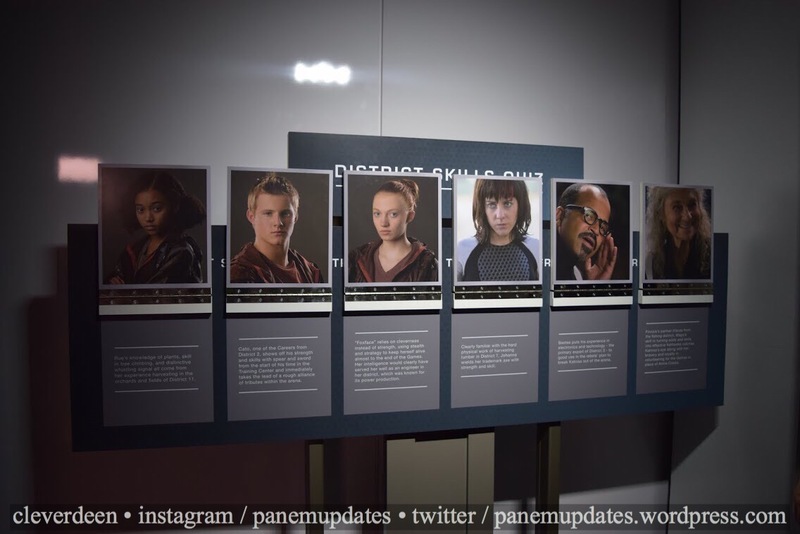 These photos were put onto a card, which you can turn in at the end of the exhibition and buy your photos in a The Hunger Games: The Exhibition Photo Book. Once everyone was done with the photo op, the doors were opened and we were let into a room with two benches and a wall in front of them. 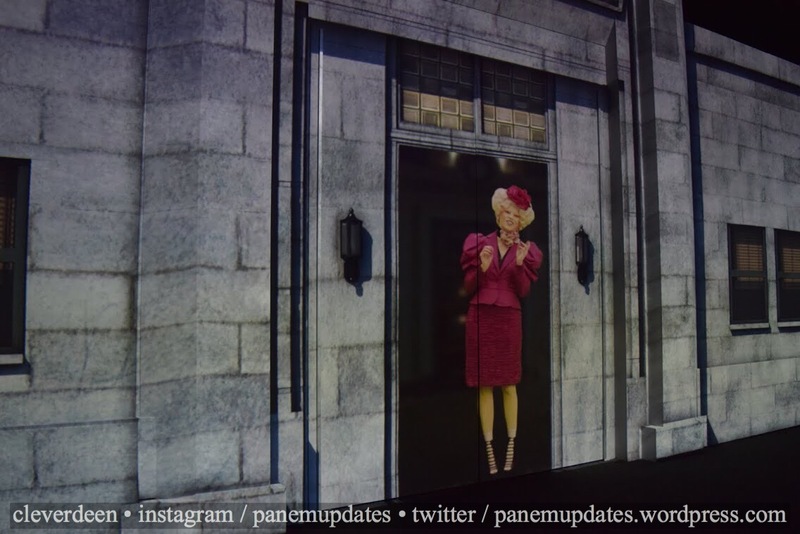 Soon, a video of Effie introducing the exhibition started playing on the wall in front of us. 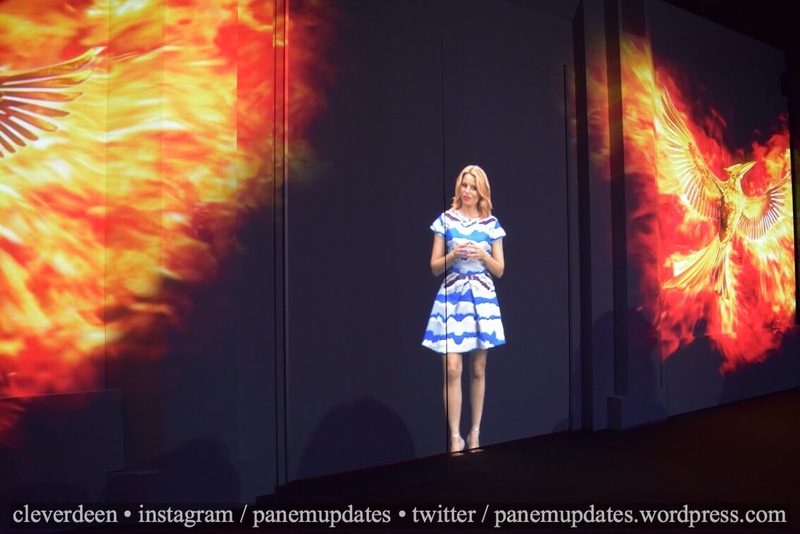 Then a montage of different scenes from all of the movies played, and Effie turned into Elizabeth Banks who continued with an inspirational speech about the THG movies. 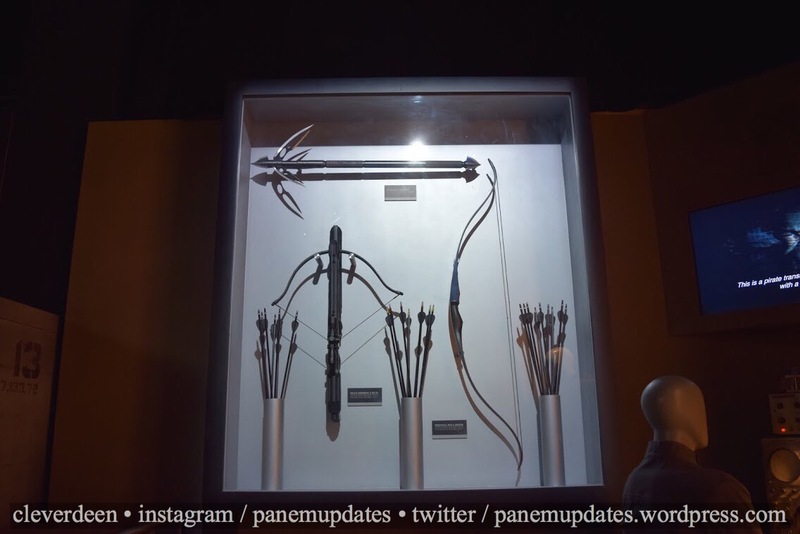 The Mockingjay symbol then transformed, and the doors in the middle of the wall opened to let us into the exhibition! 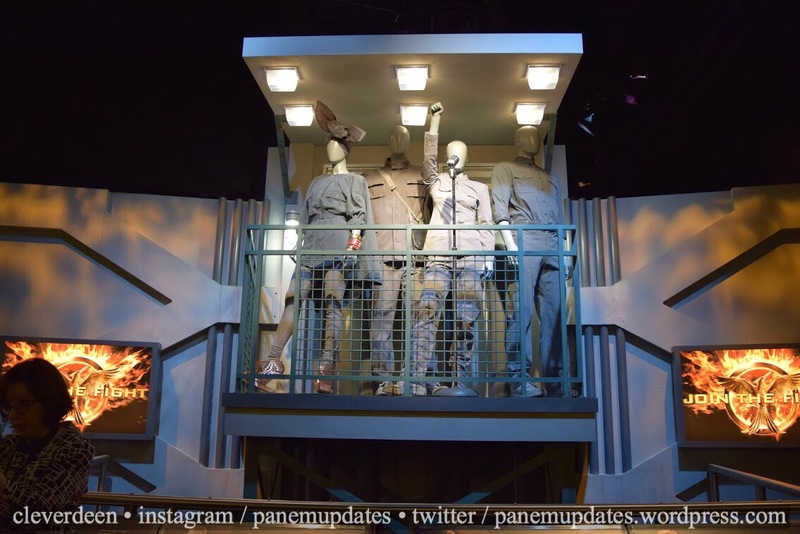 As soon as we walked in, we entered District 12. 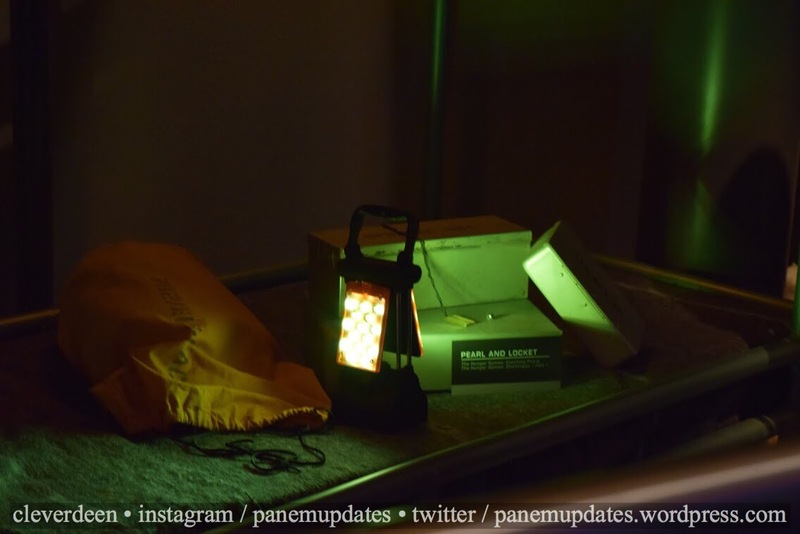 Here, we saw some props from The Hob. 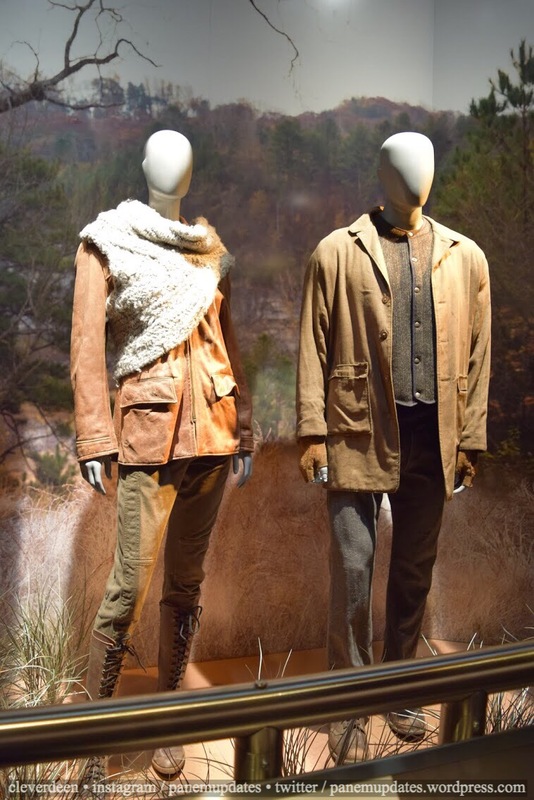 As we moved on, we saw costumes that Katniss and Gale wore in Catching Fire. 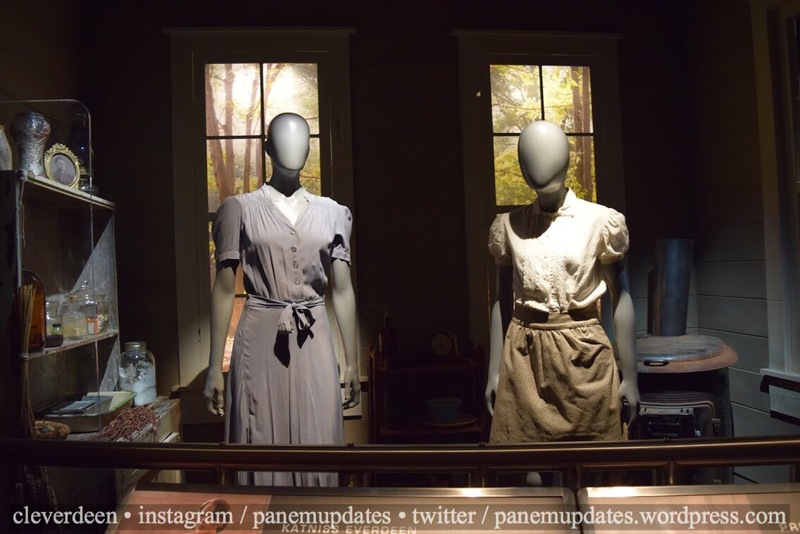 The next display featured clothes worn by Katniss and Prim to the reaping in The Hunger Games. Along the way, there were many stands featuring information about the films. In addition, there were some stands with an interactive element where one could turn a handle to vote for one of multiple options. Each time one of the handles is turned, a marble is released into a tube corresponding to that option on the back of the stand. This way, you can see how many people chose each option! 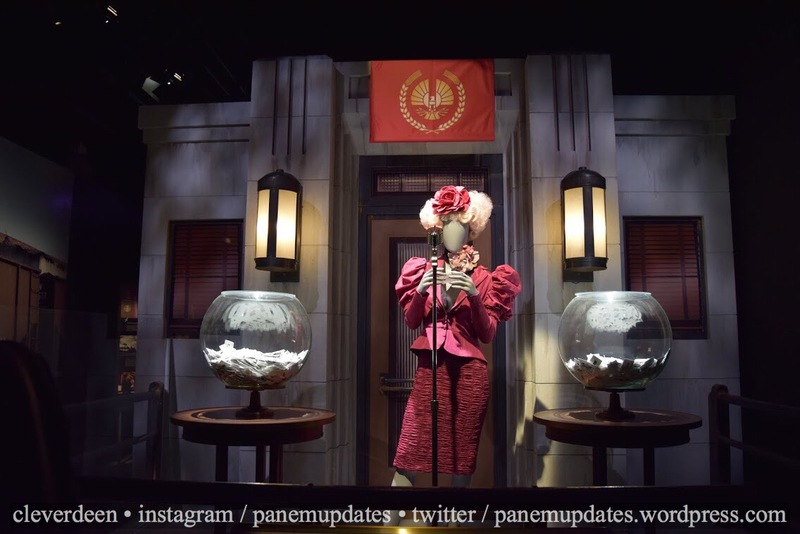 The next display continued the theme of the reaping with Effie’s reaping costume from The Hunger Games. 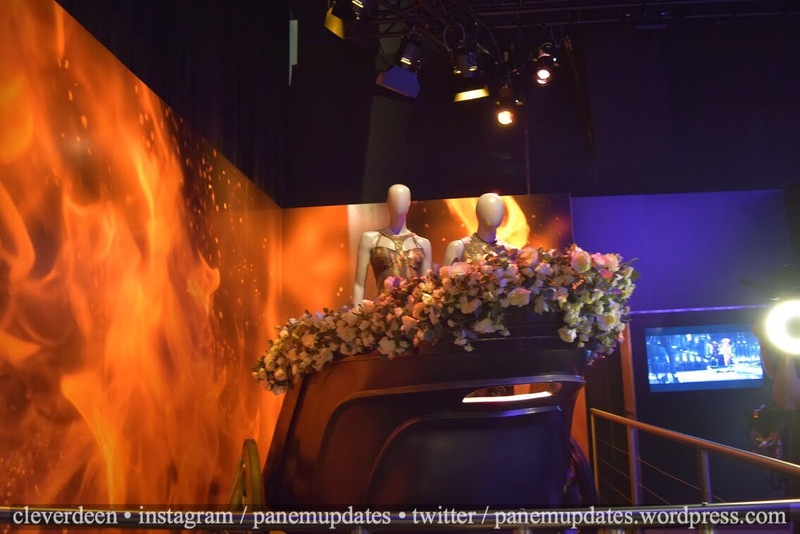 Next, we continued on Katniss’s journey with the Tribute Train portion of the exhibition. 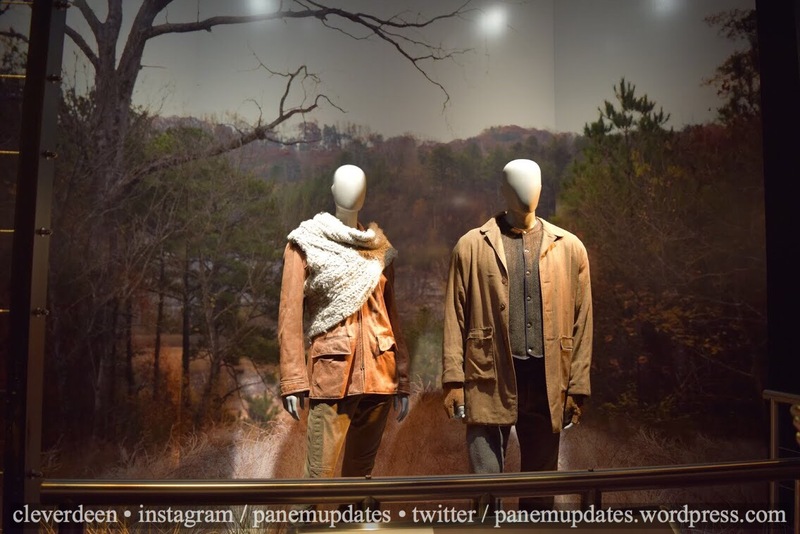 In this display, we see Peeta and Haymitch’s outfits from the Victory Tour in Catching Fire. 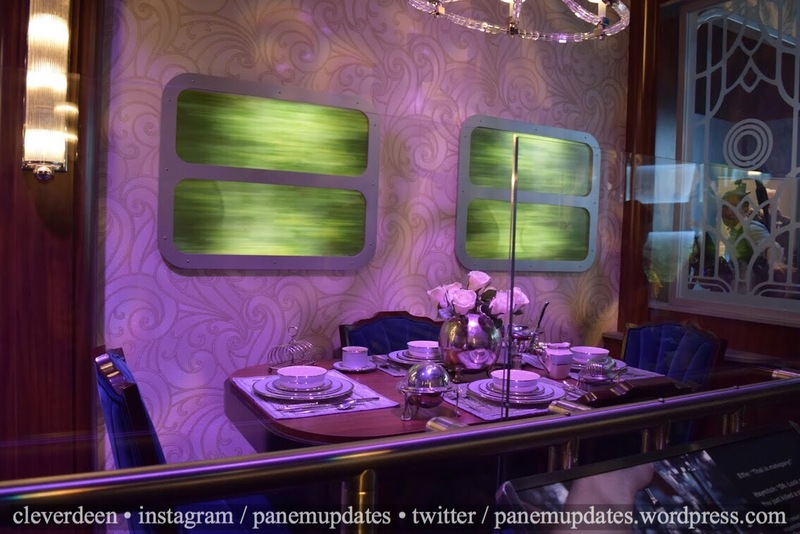 Also, we see some iconic props from The Hunger Games, including Haymitch’s favorite refreshments and the mahogany table that Katniss stabbed. 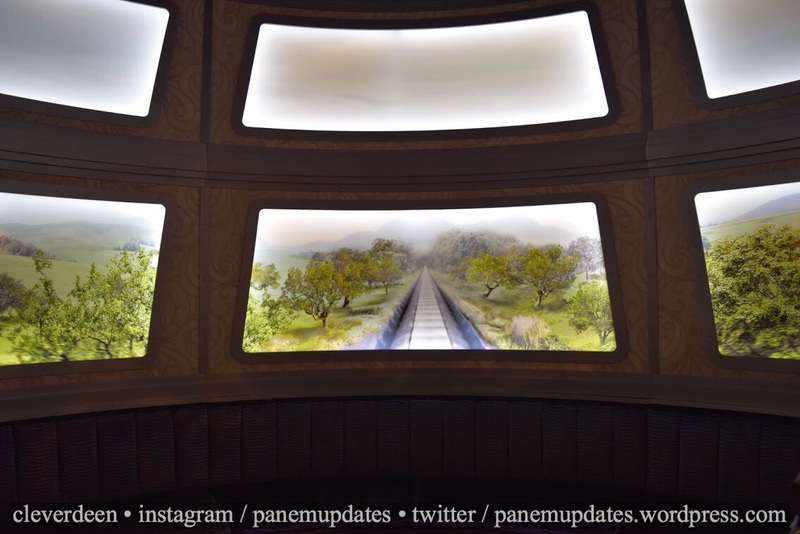 Next, we got a glimpse of Effie and Katniss’s costumes from Catching Fire and continued on to a replica of the inside of a train car also seen in the movie. 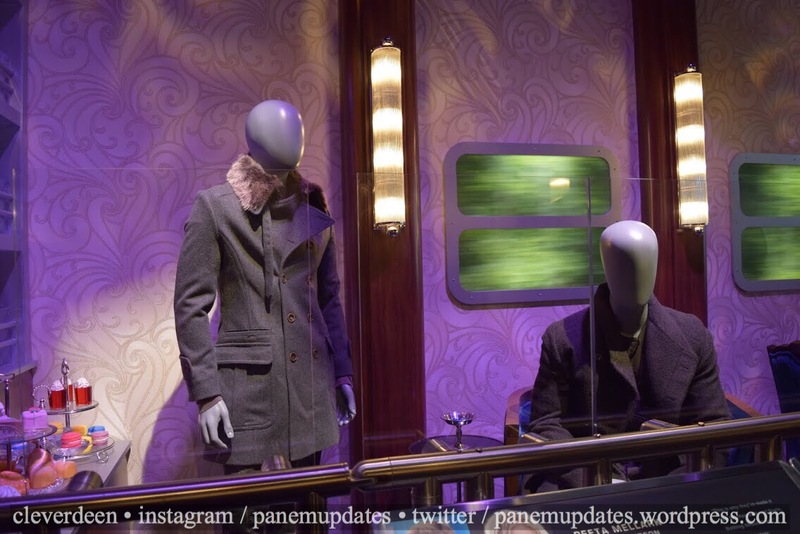 It has seats in front of the windows, and is a great place for a picture with friends! Then, we move on to the Capitol. 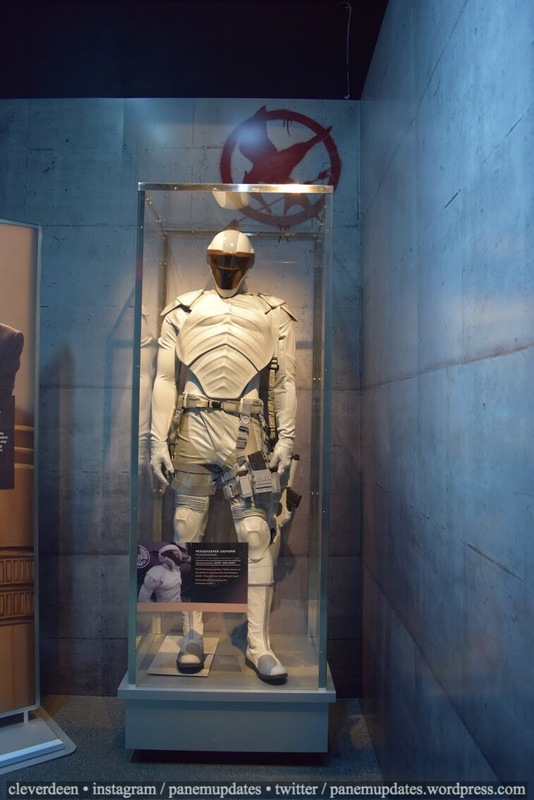 First, we see a Peacekeeper suit. 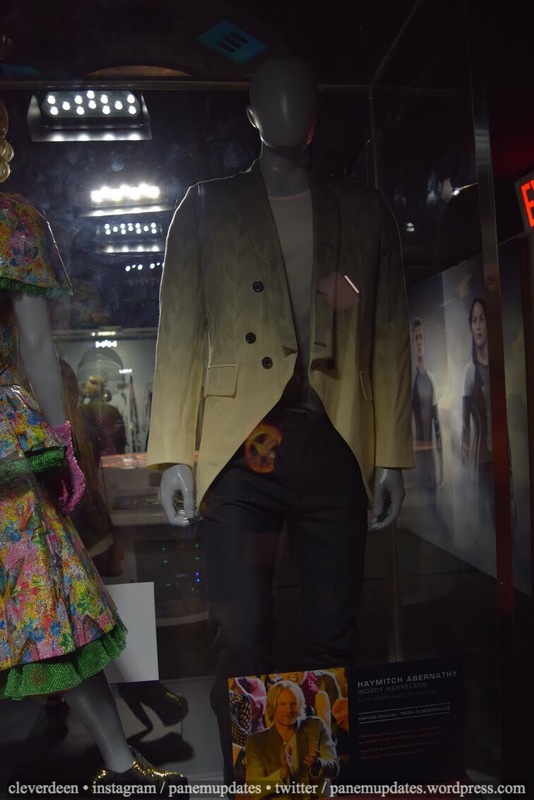 We see President Snow’s Catching Fire outfit in the next display. 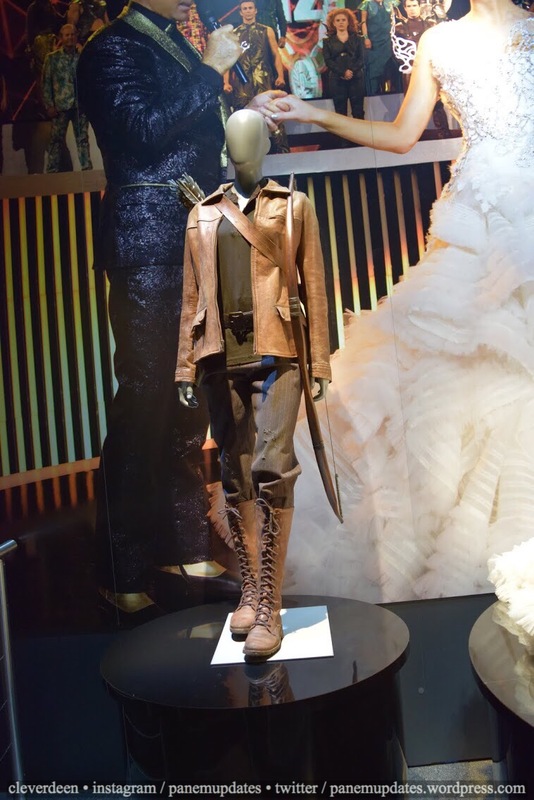 The next display features Katniss and Peeta’s gorgeous costumes from the tribute parade in Catching Fire. 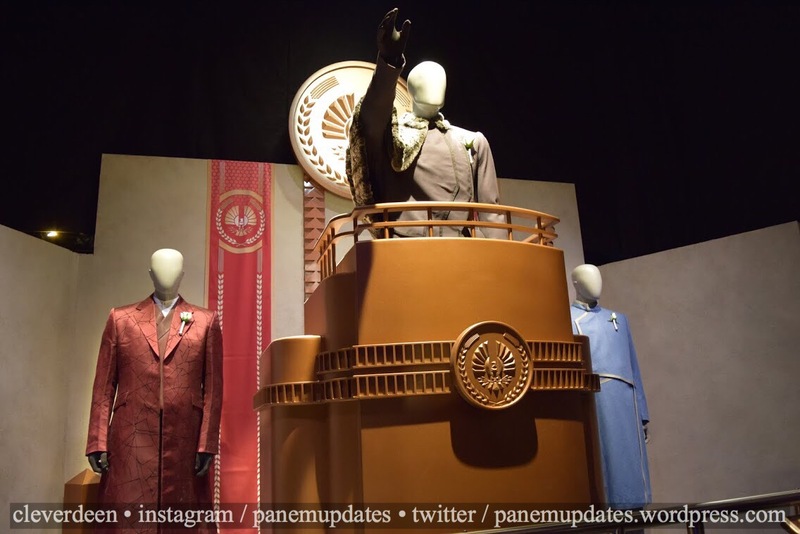 As we move on, we see some costumes from the party at President Snow’s mansion in Catching Fire. 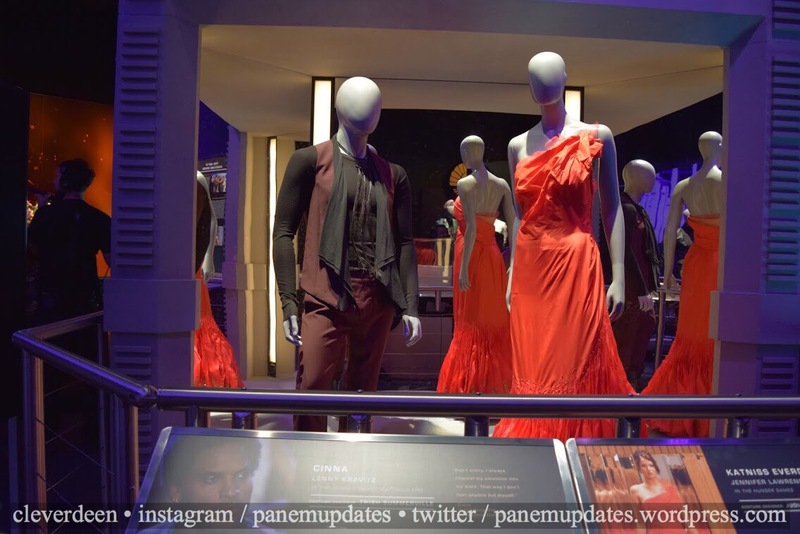 After, we come up to a display featuring Katniss and Cinna’s costumes from the interviews in The Hunger Games. 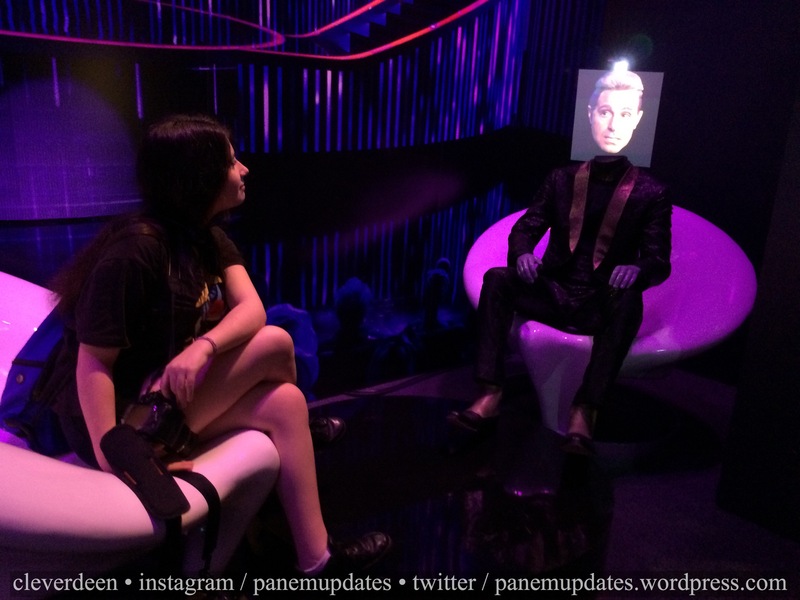 Speaking of interviews, the next attraction allows fans to have their own interview with Caesar Flickerman! 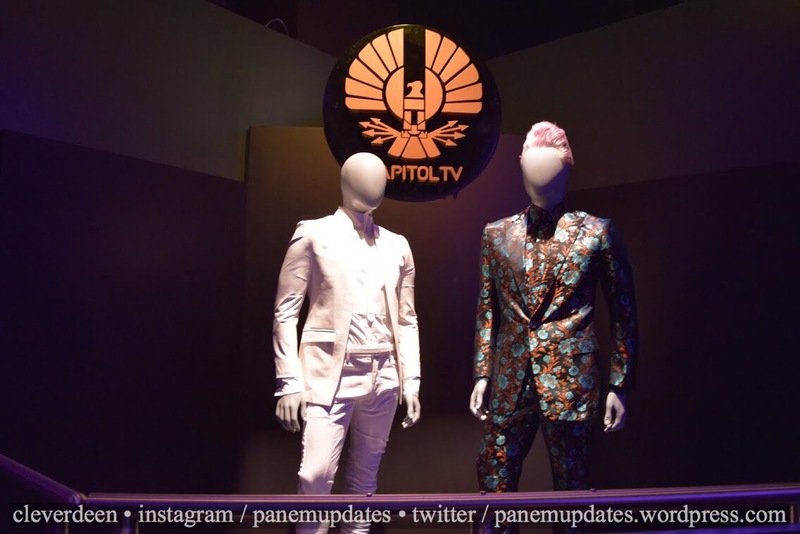 Once your interview is done, you’ll see Caesar and Peeta’s costumes from Peeta’s first interview in Mockingjay Part 1. 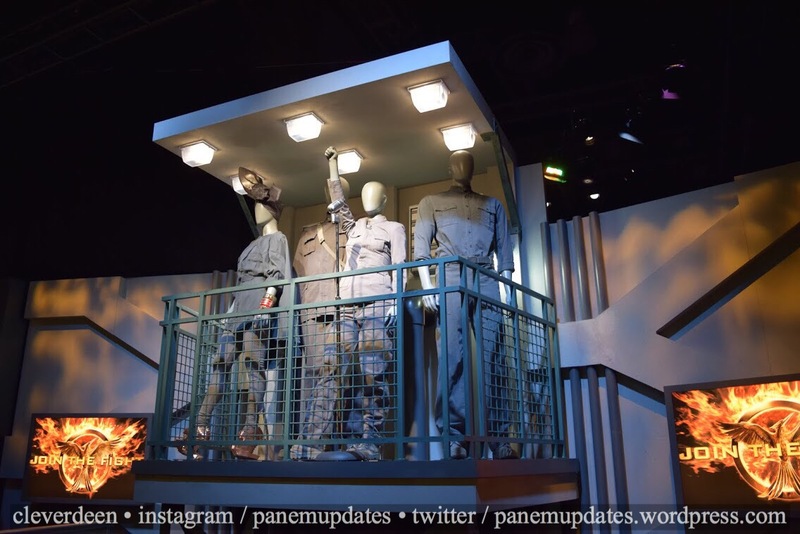 Next, we move into a room with tons of displays. 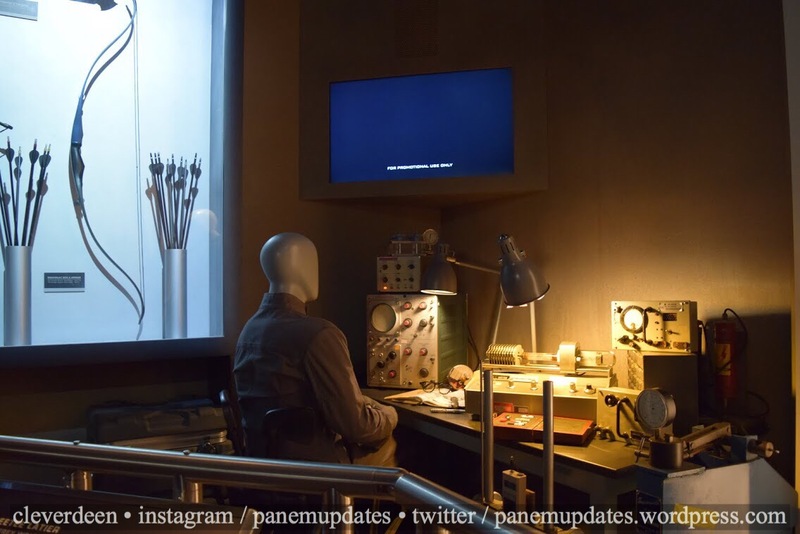 This is the “Making The Games” section of the exhibition. 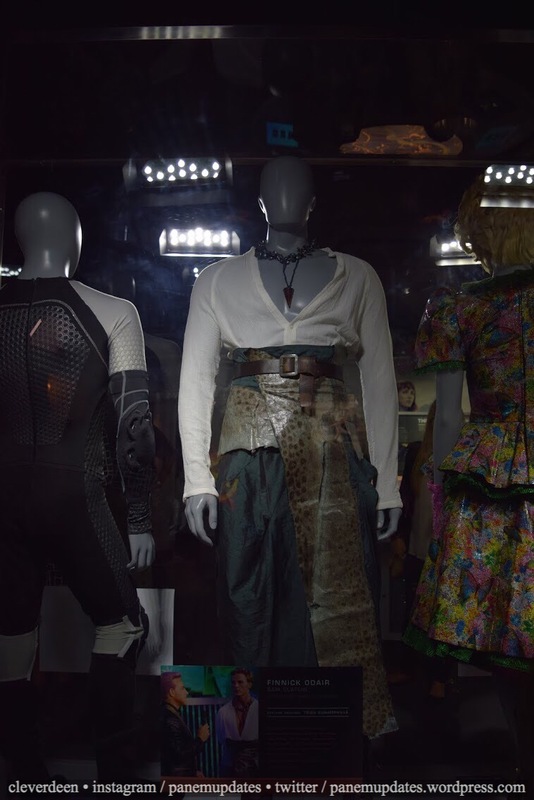 Here’s a display with costumes and props from The Hunger Games and Catching Fire. 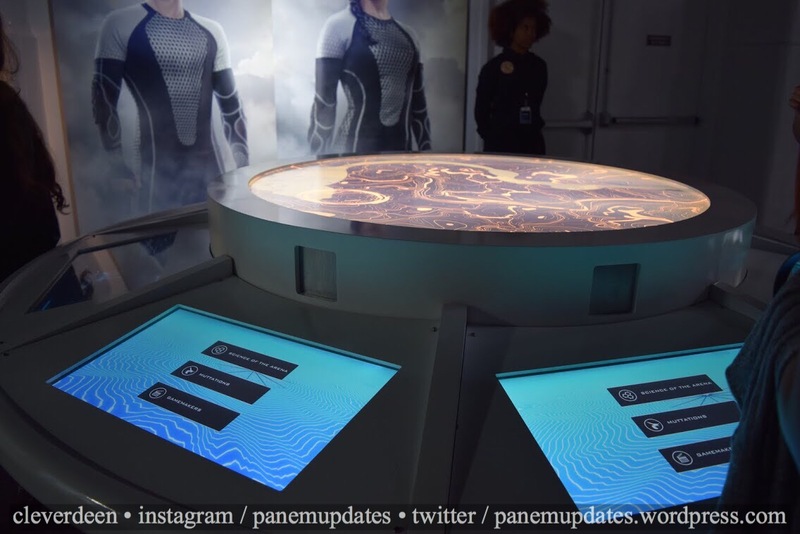 The interactive element of the section allows one to take the place of a gamemaker. 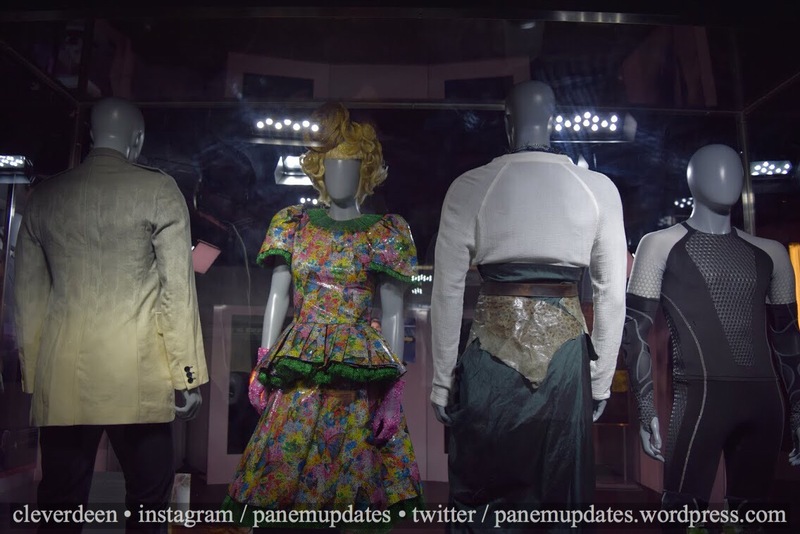 Right in the middle of the room, there’s a display with Haymich, Effie, Finnick, and Peeta’s costumes from Catching Fire. 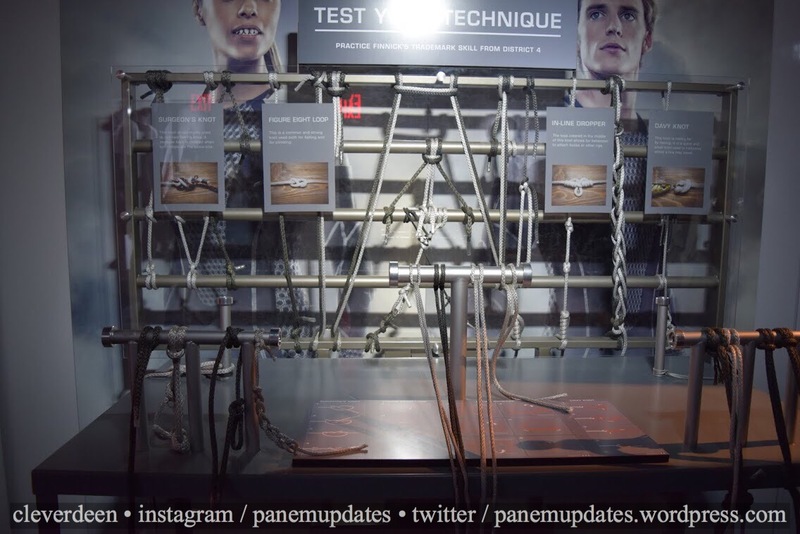 There’s also a knot tying station where you can test your skills at Finnick’s signature pastime. 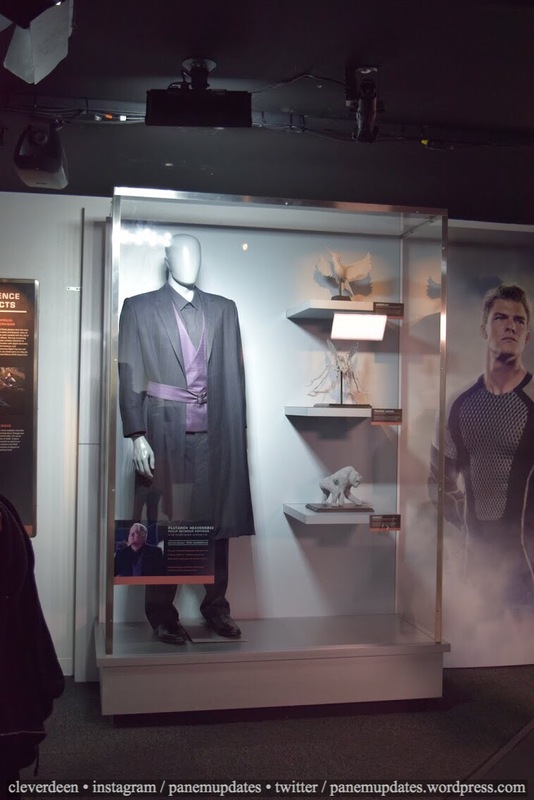 On the wall, a display featuring Plutarch’s gamemaker costume as well as sculptures of some of the muttations seen in the movies can be found. 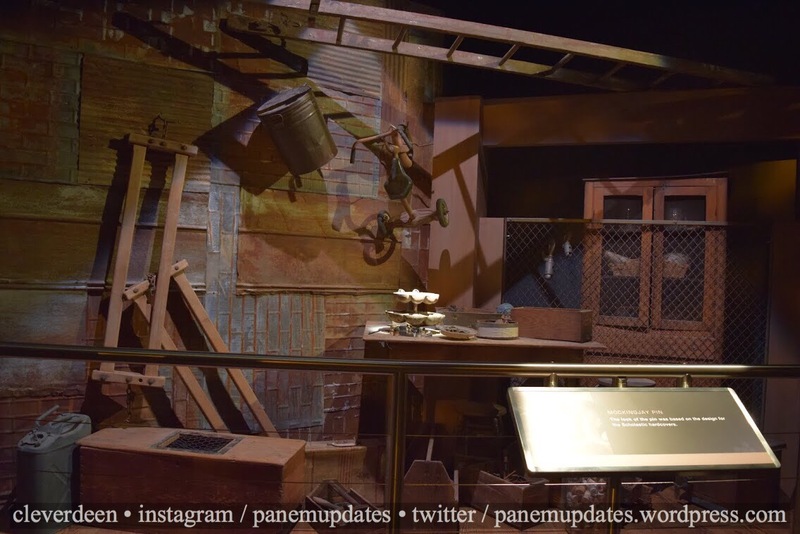 There’s also an interactive element at the end of the room where two fans at a time can learn some simple fight choreography. The station is able to sense where your body is so you can see if the movements you make are correct as you’re doing them. Right before we reach the exit, a fun quiz on the different skills of the districts can be found. 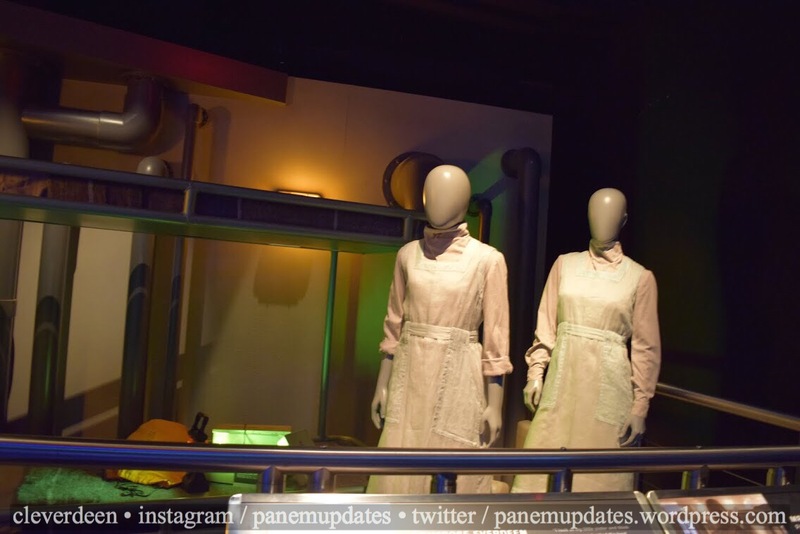 Next, we enter the District 13 section of the exhibition. 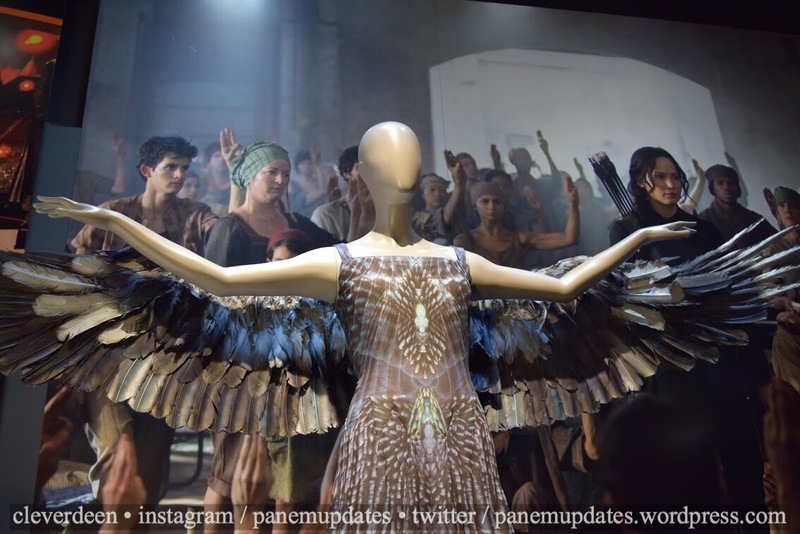 It starts off with a powerful display of some key costumes from Mockingjay Part 1. 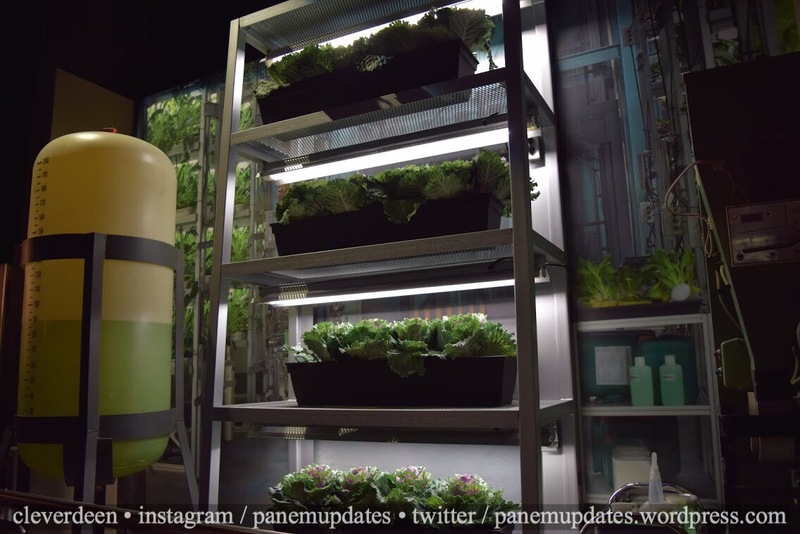 As we move on, we see some scenery from the greenhouse, as seen in a deleted scene found on the Mockingjay Part 1 DVD/Blu-Ray. 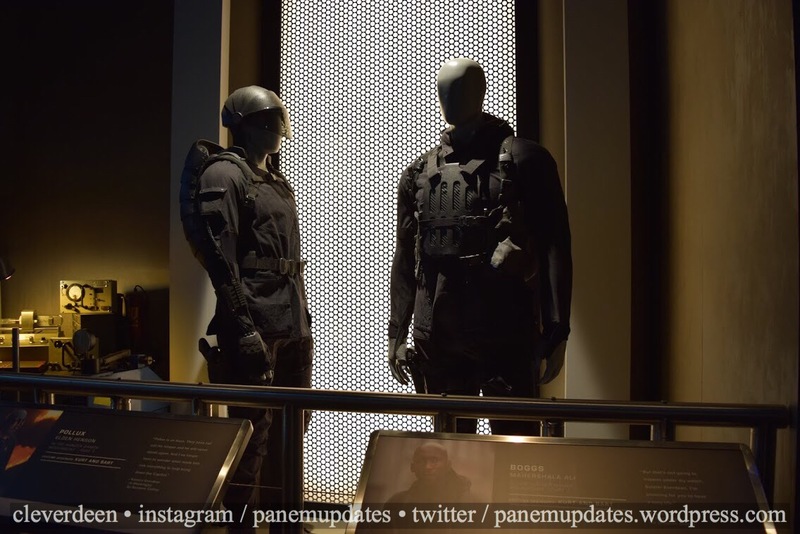 Then, we can see Boggs and Pollux’s costumes from Mockingjay Part 1. 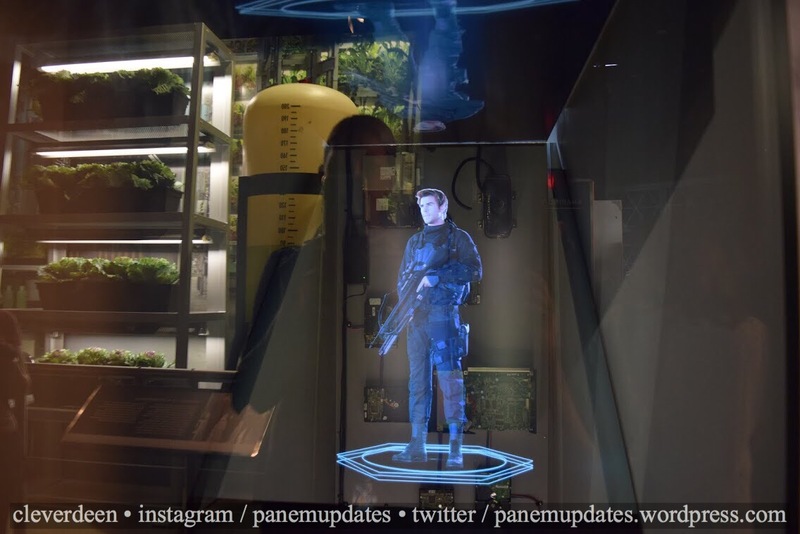 Moving onto the command center of Distict 13, we can see Beetee’s costume and the weapons he designed. 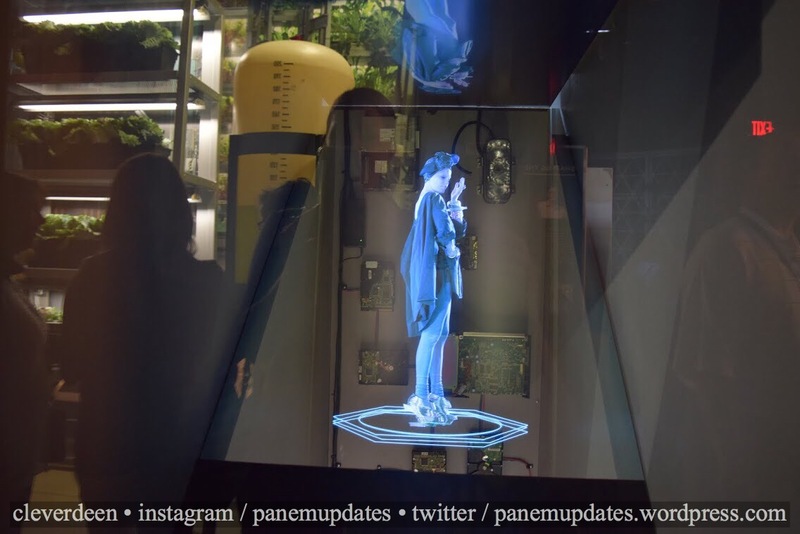 Some moving holograms of Katniss, Gale, Finnick, and Effie can be seen next. 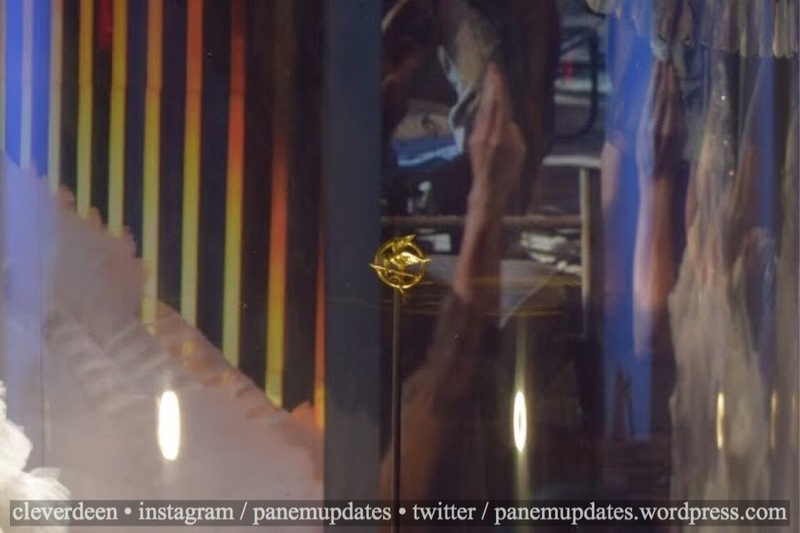 Peeta’s pearl and locket! 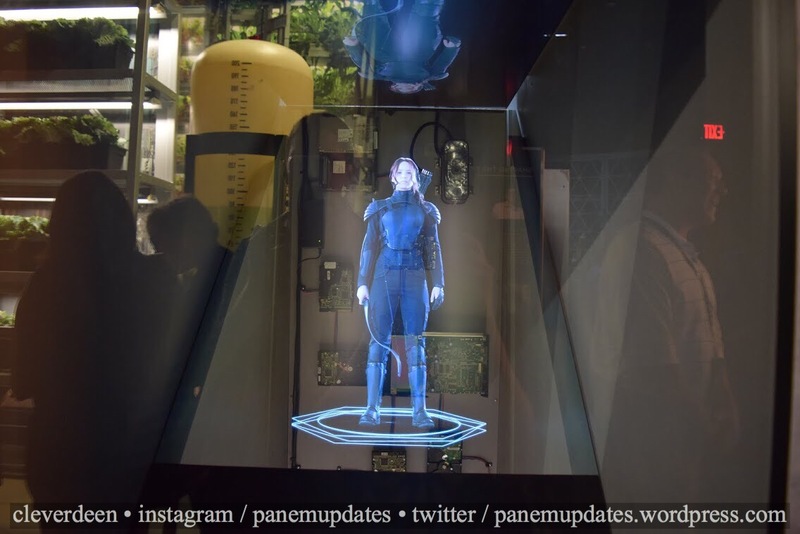 Finally, we arrived at the costumes from Katniss and Gale’s journey above ground in Mockingjay Part 1, marking the end of the District 13 section. 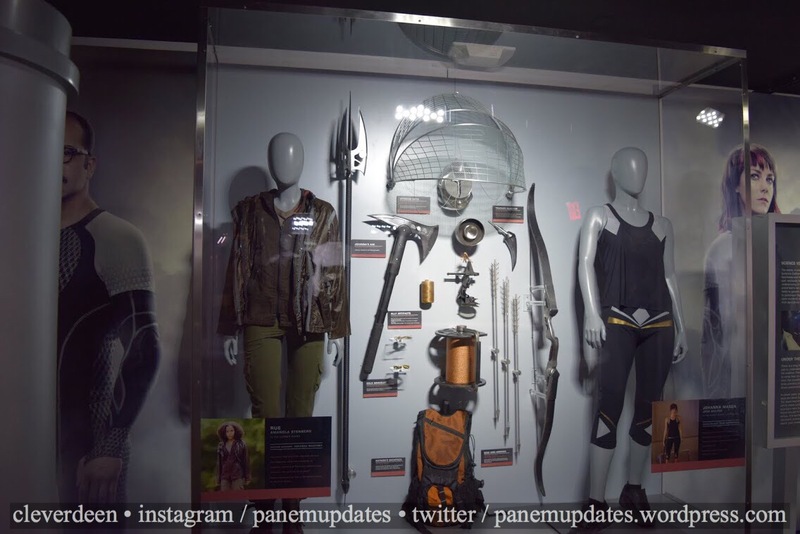 The next section of the exhibition is called “Katniss’s Journey”. 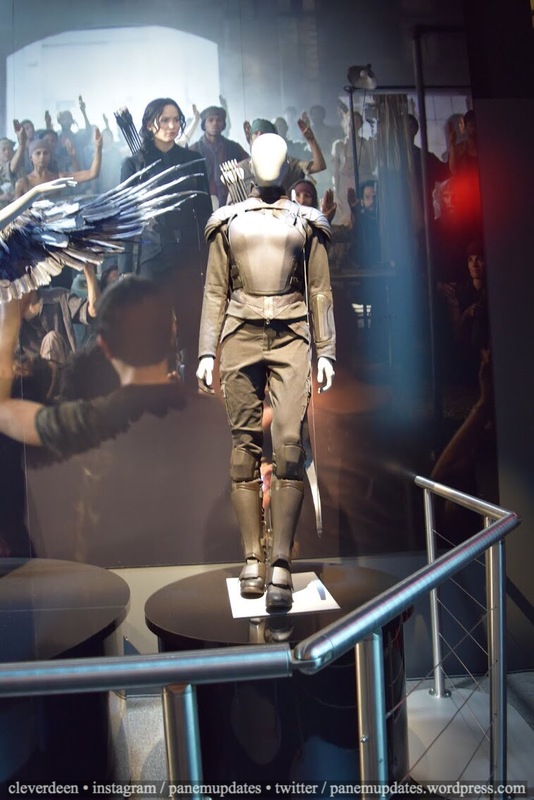 It highlights Katniss’s transformation from a girl in District 12 to the Mockingjay with four of her most iconic costumes. 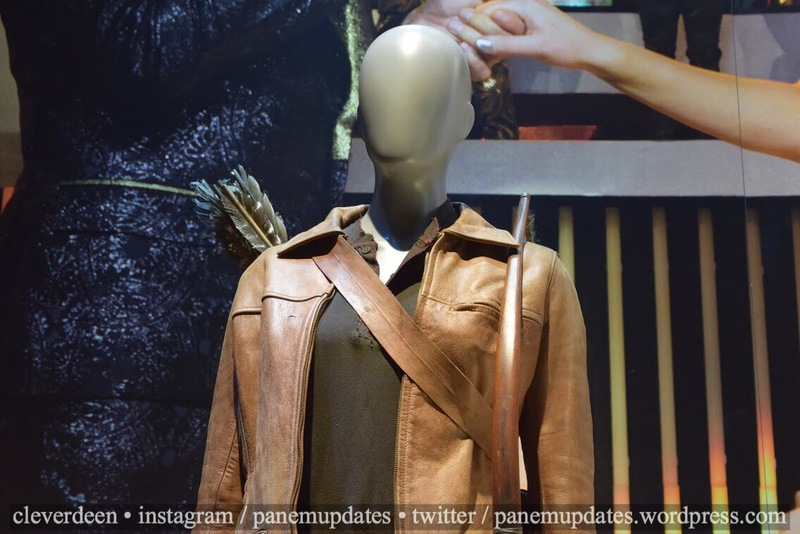 First, we have the outfit Katniss wears to go hunting at the beginning of The Hunger Games. 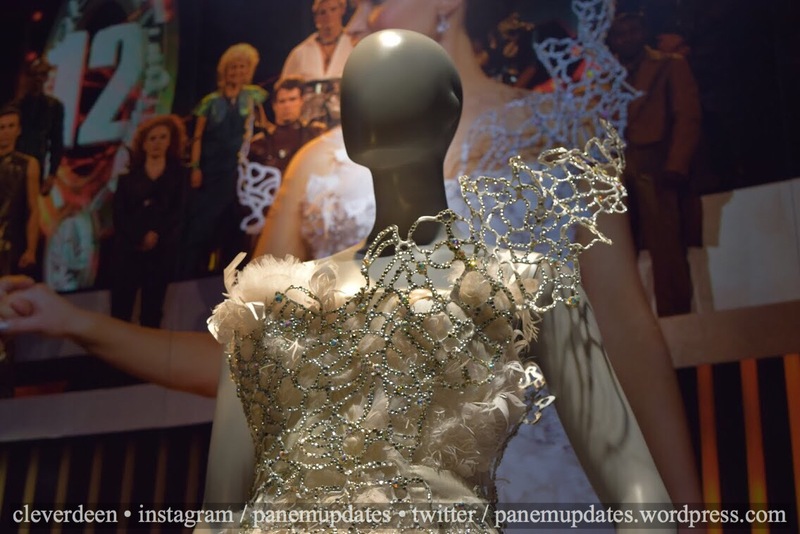 Next, Katniss’s gorgeous wedding dress from Catching Fire can be seen. It’s even more stunning in person! 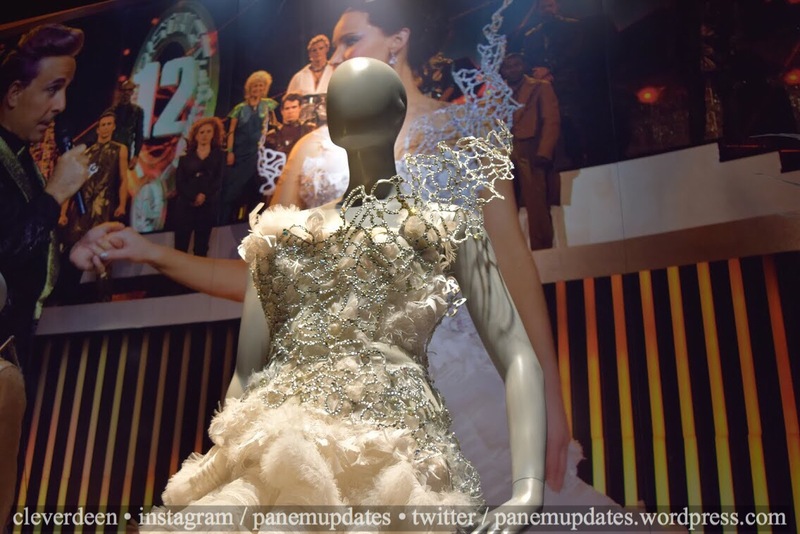 Then comes Katniss’s Mockingjay dress from Catching Fire. 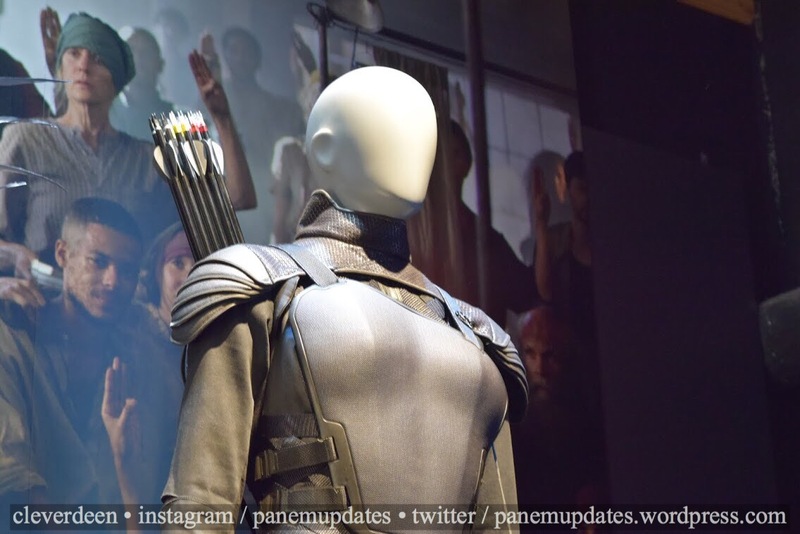 Lastly, we see Katniss’s Mockingjay suit. 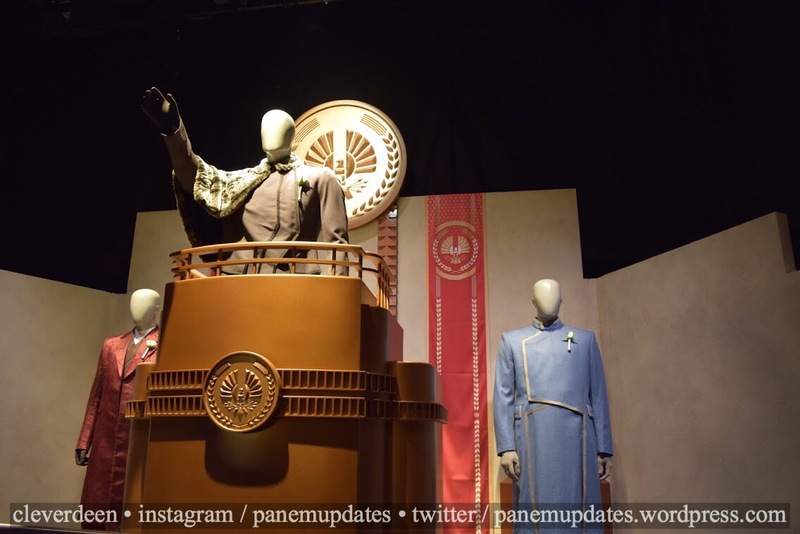 In the middle of this display was a tiny and shiny gold Mockingjay pin. 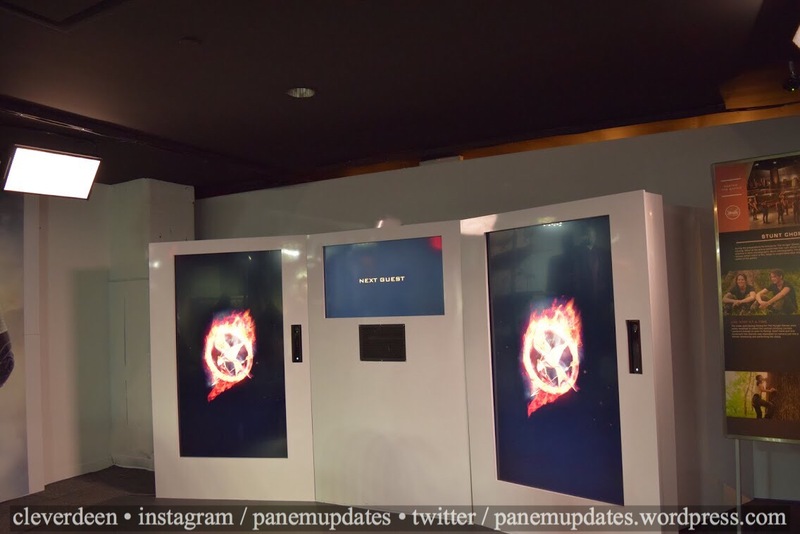 On the way out, there is a sign featuring the Mockingjay Part 2 tagline on the wall. This marks the end of the actual exhibition, but the activities are far from over. 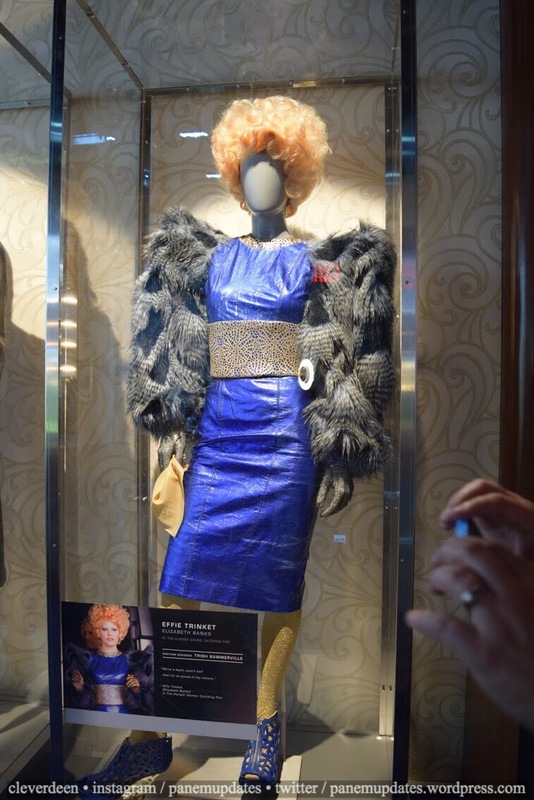 First we walk through the fan gallery, which has artwork from fans all around the world displayed. 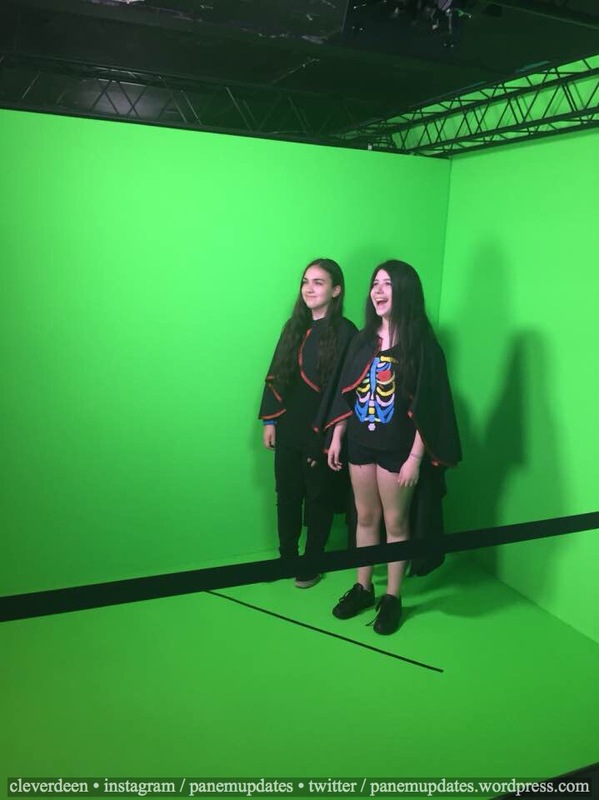 We then enter a room where we can put on capes and stand in front of a green screen for another video/photo op – this time, it’ll look like we’re riding on Katniss and Peeta’s chariot from the tribute parade in Catching Fire. Make sure you still have your card from the beginning of the exhibition, because you’ll need it to put this video and photo on. 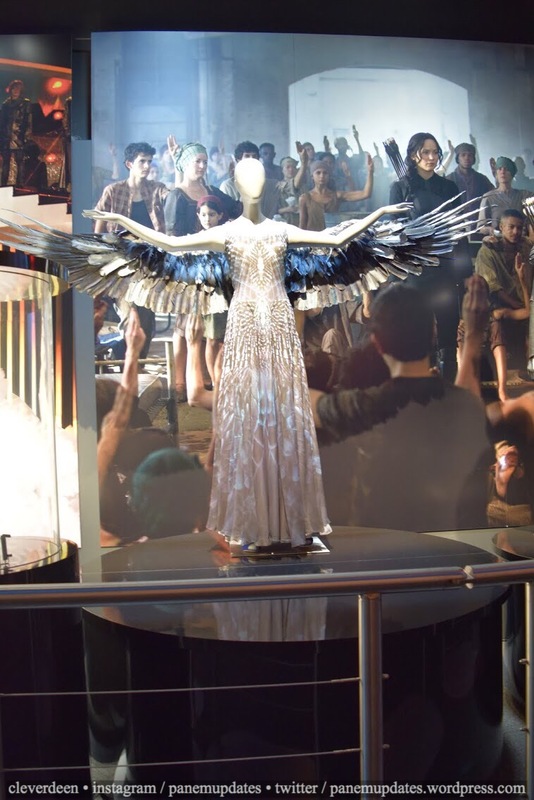 First, for the video, we were told to wave and be happy because the whole crowd was there for us, then we glared at President Snow as our costumes caught fire, and finally we had a few second to do whatever we wanted. Then they’ll take a still picture, and then we returned the capes, returned our audio guides, and gave our card to the people at the checkout desk where we could buy our video and photos. Now it’s time for the gift shop! When I say this gift shop has everything, I mean it has literally everything. Shirts, backpacks, blankets, pillows, socks, scarves, mugs, mints, coasters, books, posters, pins, jewelry, stuffed animals, barbies, and much much more. 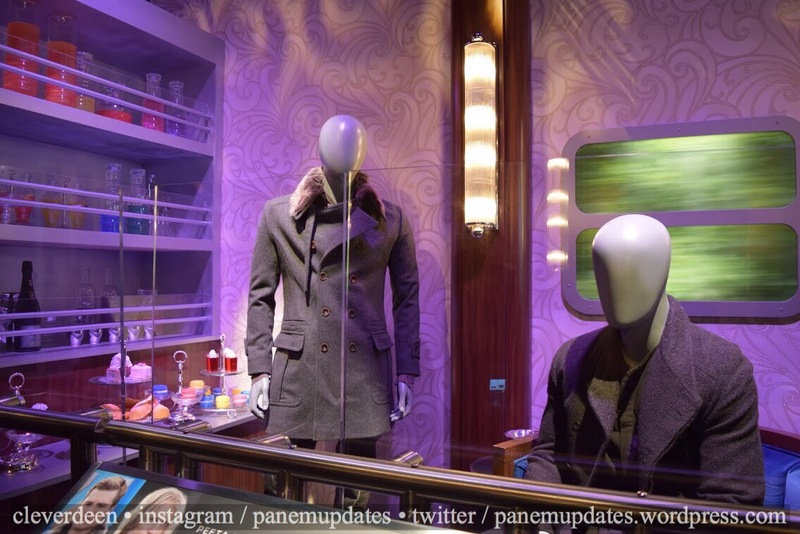 There was even a Mockingjay pin made out of real gold that costs $7,500! 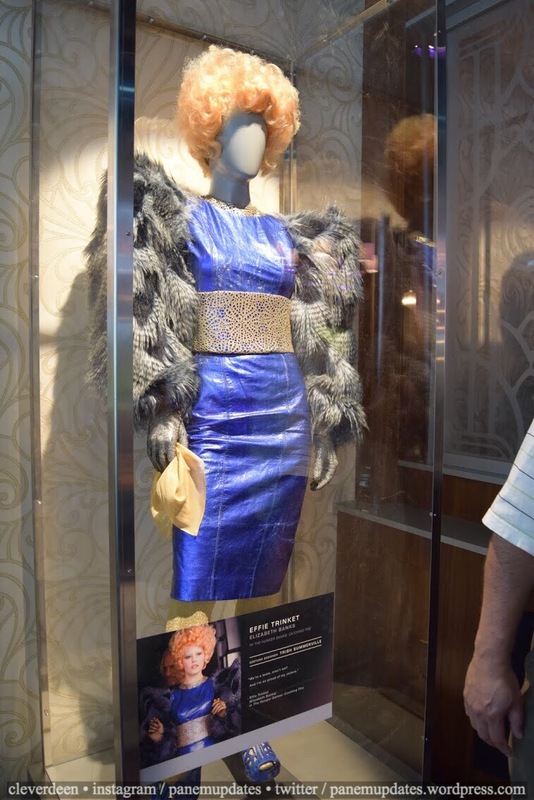 Once you’ve bought all the merch your heart (and wallet) can handle, it’s time to leave the exhibition. It was a very fun and interesting experience, and something that I’d definitely recommend doing more than once! 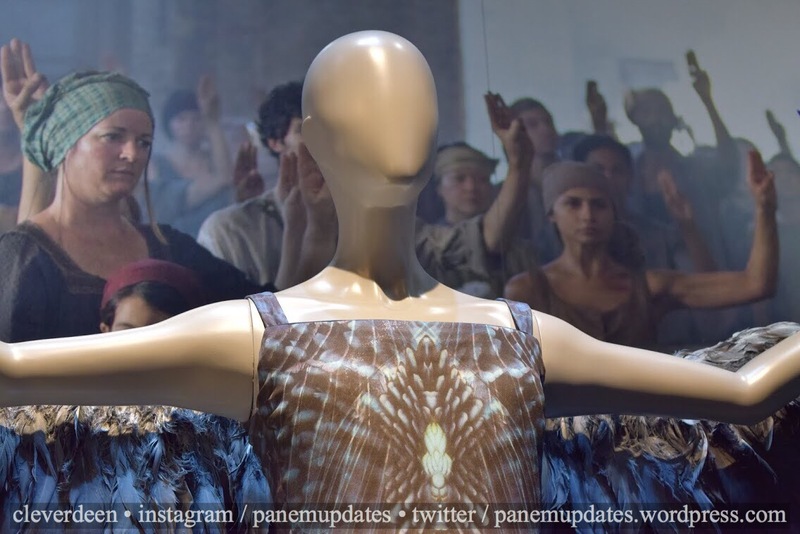 To get your tickets to The Hunger Games: The Exhibition, which opens to the public on July 1st, click here. 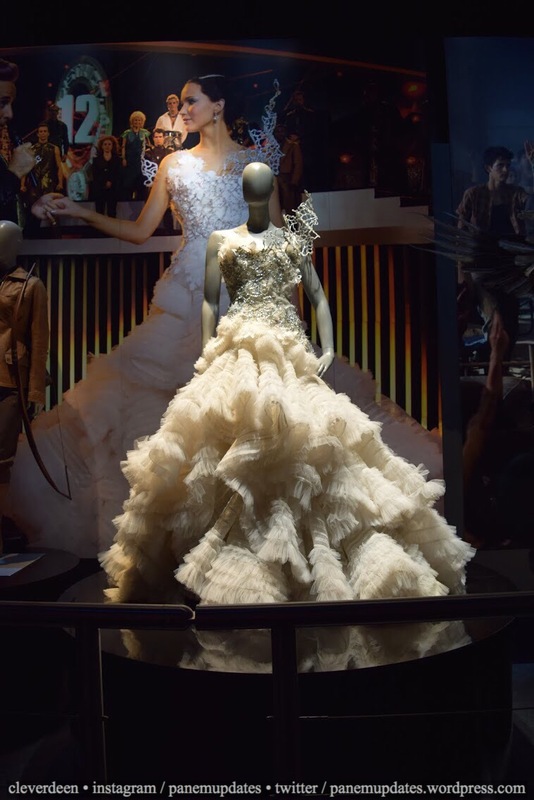 The Hunger Games: The Exhibition Tickets Now On Sale! 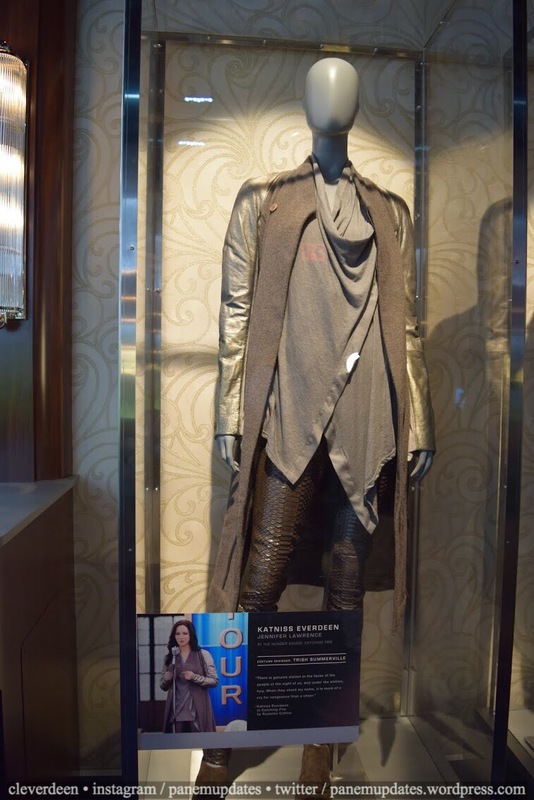 Do you remember how much Katniss’s cowl was going for? 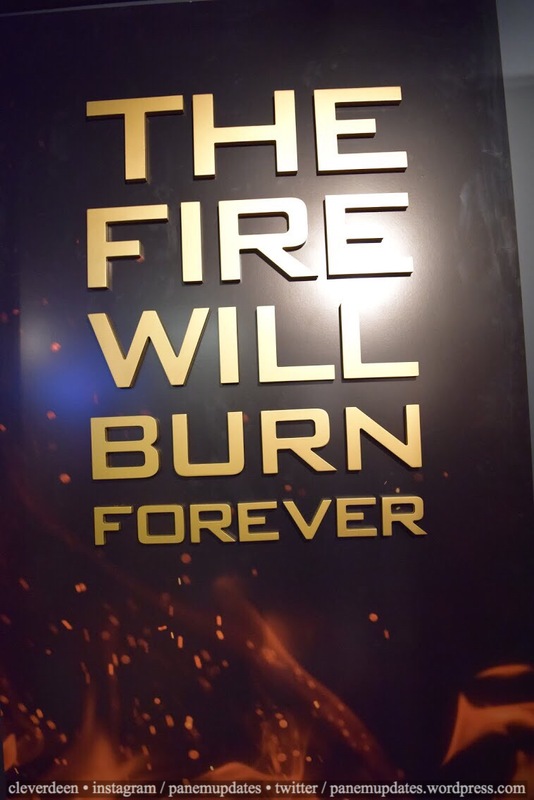 And if Lionsgate will release it for online purchase? Also how much did the video of the Tribute Parade cost? 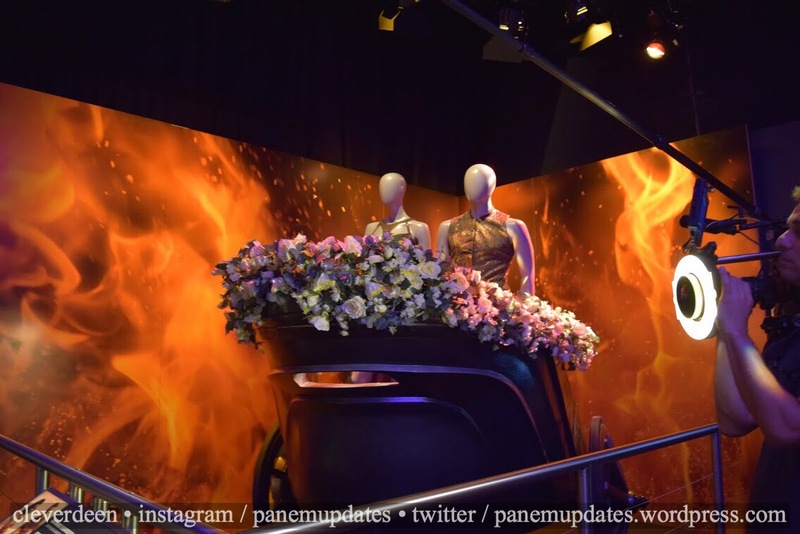 I believe it was $130 and Lionsgate hasn’t announced what products they’ll put online yet so I don’t know. 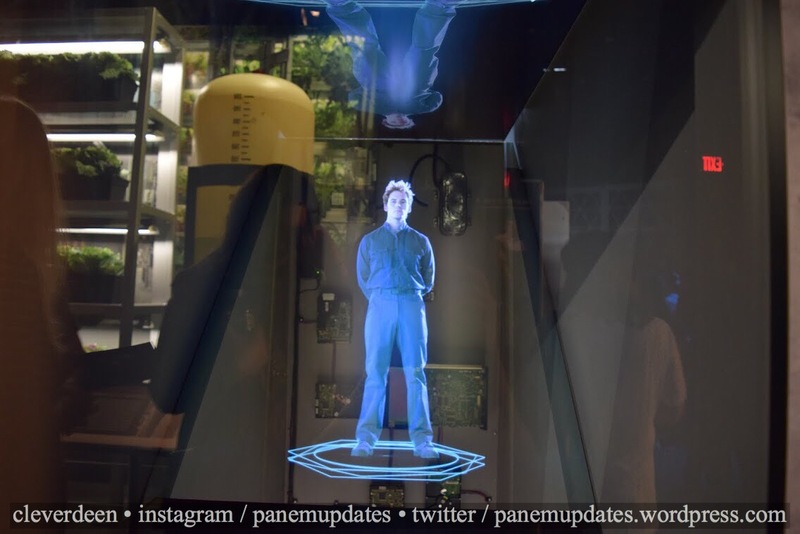 Pingback: Jogos Vorazes BR ‘The Hunger Games: The Exhibition’ começa dia 1º de julho em NY! Definitely! You get to enter at any time, get an audio guide which is really cool, and get a discount at the store for only about $15 more! 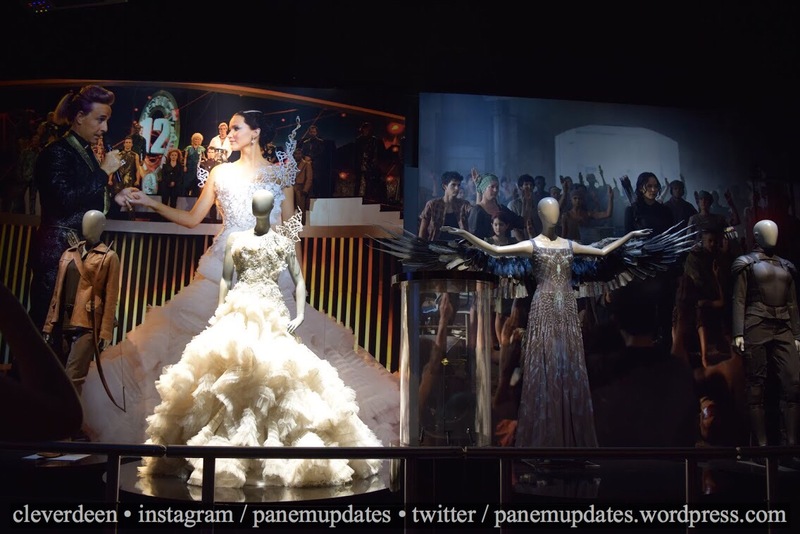 Mockingjay Part 2 is now in theaters!